Abby Johnson + 300 participants + YOU = AMAZING! 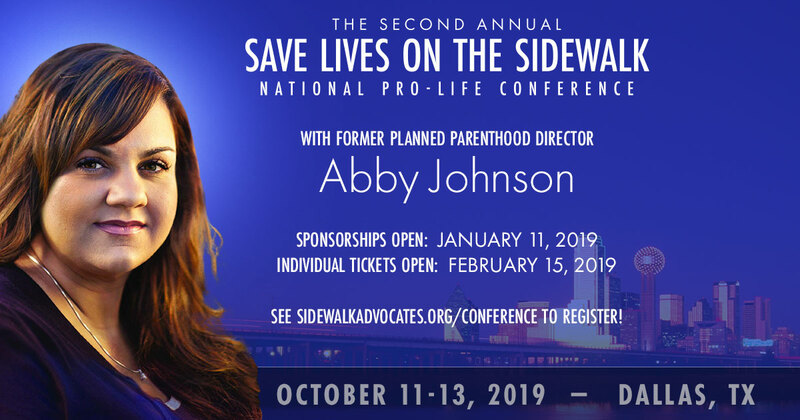 If you’re with a pro-life, pro-family organization, sponsorships for the Second Annual Save Lives on the Sidewalk National Pro-Life Conference with Abby Johnson are now OPEN at sidewalkadvocates.org/sponsorship! To secure your sponsorship, click on the link and fill out the sponsorship page; we’ll check availability, and once approved, a member of our team will respond back via email with the payment link. We look forward to partnering with you in this great event to help save more lives and end abortion through the power of His love! Questions? Drop me a line back! Thanks so much!